I wanted to try to capture the root causes and effects of Birth Trauma in a way that was visual to help others understand and also raise awareness. It highlights that there are many root causes of Birth Trauma. All unique in experience to the woman (or partner) affected. She may have experienced all or some of the causes, this doesn’t matter. What matters is how this has affected her and what her feelings are around her birth experience. 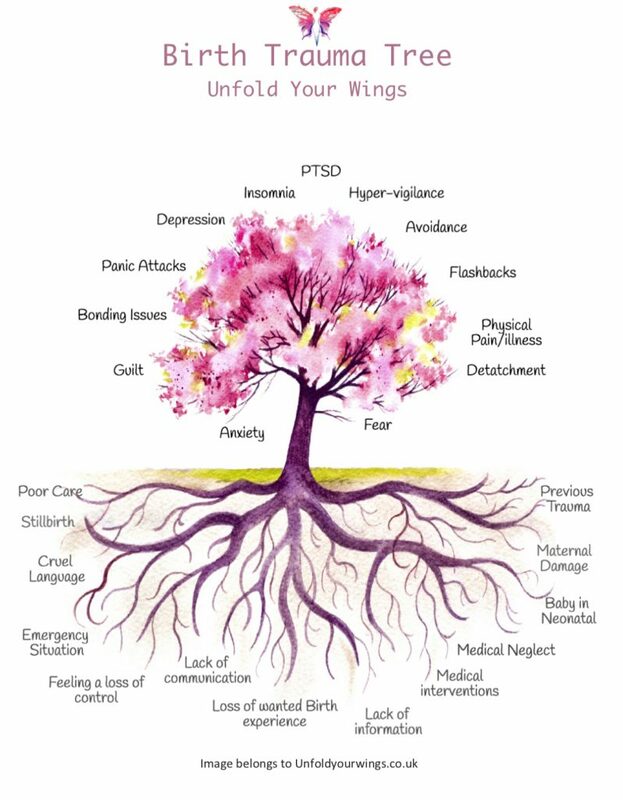 The Birth Trauma Tree highlights that these root causes and the trauma causes can be watered by the experience not being acknowledged, wrongly diagnosed or support not being given/available. This allows the roots of trauma to imbed deep causing growth into the the symptoms we see on the tree, sometimes leading to PTSD, Postnatal Depression or other mental health conditions. It is important that the impact of a traumatic birth is acknowledged and women and their families are given the support they need. Especially if you care for women who have given birth being aware of the signs and taking notice that they may be showing some of the signs of trauma below is important so that you help them to find the support they need. The PDF version to download here Birth Trauma Tree. Please do not share without permission or crediting Unfold Your Wings.